This little critter is the most poisonous jellyfish in the deep. Its nematocysts hold the most fatal venom, which goes for the cardiovascular and the nervous system. The worst part is the accompanying pain. On a couple of occasions it has been described as unbearable and overbearing. Treating with vinegar has been considered as a first aid measure, but there is only so much it can do, because with the pain, it does nothing to alleviate it. Statistically speaking, without immediate treatment, the chances of survival of a box jellyfish sting are slim to none, especially for someone with a weak heart. There are times when king is not used to cite the deadliness of the creature, but rather its size. 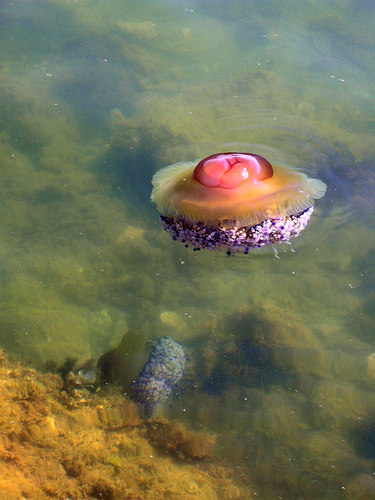 Size always comes as a form of superiority in the animal kingdom, and with the jellyfish, its no exception. This entry was posted in 5% acetic acid/Vinegar on jelly stings, Box jellyfish, florida-jellyfish-portuguese-man-of-war-florida-beaches-long-island-beaches-hawaii-waikki-oahu-guam-austalia-stingersmauve-jellyfis-pelagia-nortiluca-black-sea-nettles-stingrays-sport-fi, jellyfish, jellyfish species, jellyfish sting first aid, Jellyfish sting remedy, jellyfish stings, Jellyfish stings, vinegar, acetic acid, Lion's mane jellyfish, Man of War, marine sting first aids, marine stings, Pacifici coast sea nettles, Pelagia Nortiluca, sea nettles, StingMate, Uncategorized, Vinegar on Jellyfish stings. Bookmark the permalink.